Prepare to return to the world of Magnamund, this time with your friends. The Lone Wolf Multiplayer Game Book is a full roleplaying game, based on the simple rules system of the solo books - it is so easy, anyone can play. The mightiest of nations in Northern Magnamund is fully explored and detailed in this sourcebook for the Lone Wolf Multiplayer Game Book. 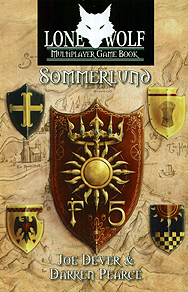 Intended as a resource for both games masters creating adventures and players wanting to know more about the land of the Kai Lords, this book covers the people, cities, and history of Sommerlund, from its earliest days of founding to the current trials against the Darklords.